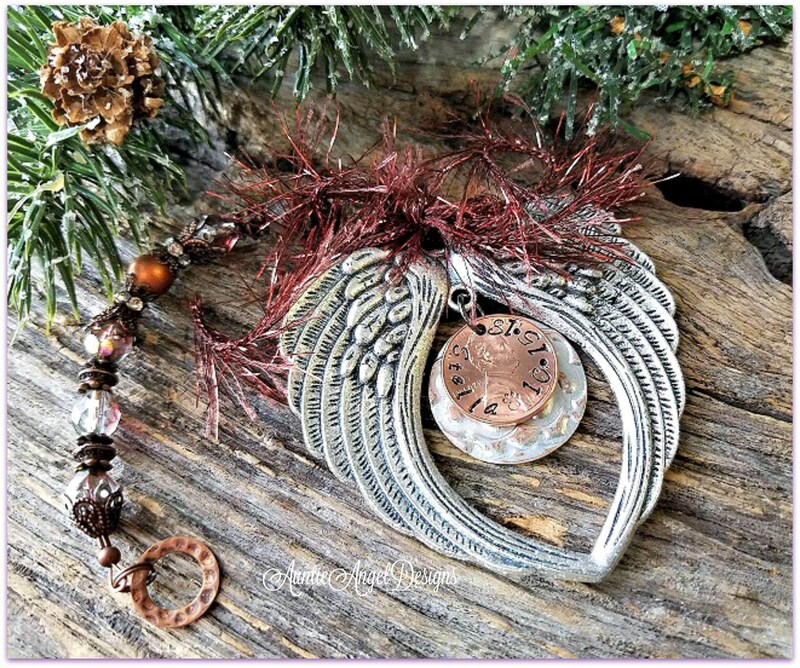 A custom penny from Heaven angel wings ornament is a great memorial gift for someone who has lost a friend or loved one, both human and pet. The hand-stamped penny with your beloved's name will give a sense of peace and comfort to the grieving heart. 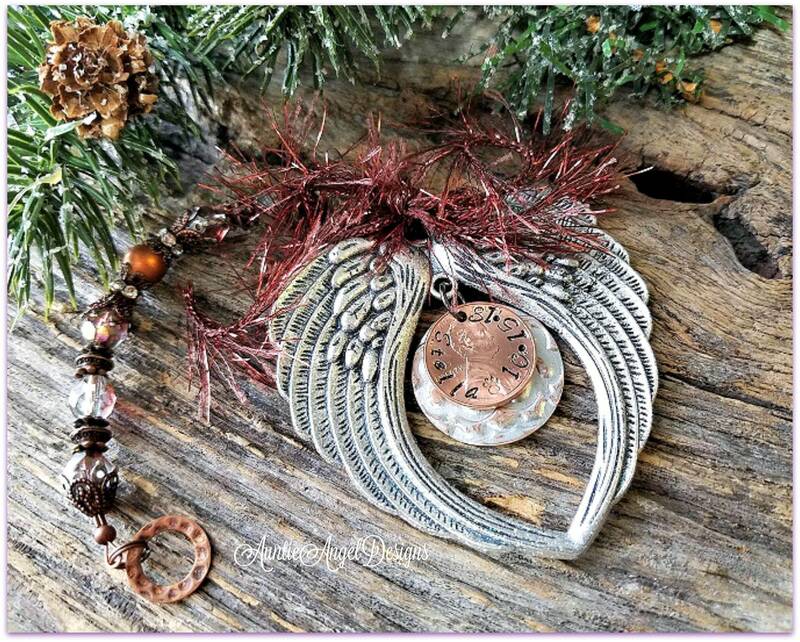 Each metal angel wings ornament is 2.5" x 2.5" and is made of zinc-based alloy which is lead and nickel safe. The wings have been painted by me with a shimmering opal-colored glitter paint. A copper embossed disk has been hand-painted with silver paint and burnished and is topped with a hand-stamped shiny penny. I can stamp a pet or person's name with a full date with a tiny paw print for the pet or tiny heart for the person between the name and date. 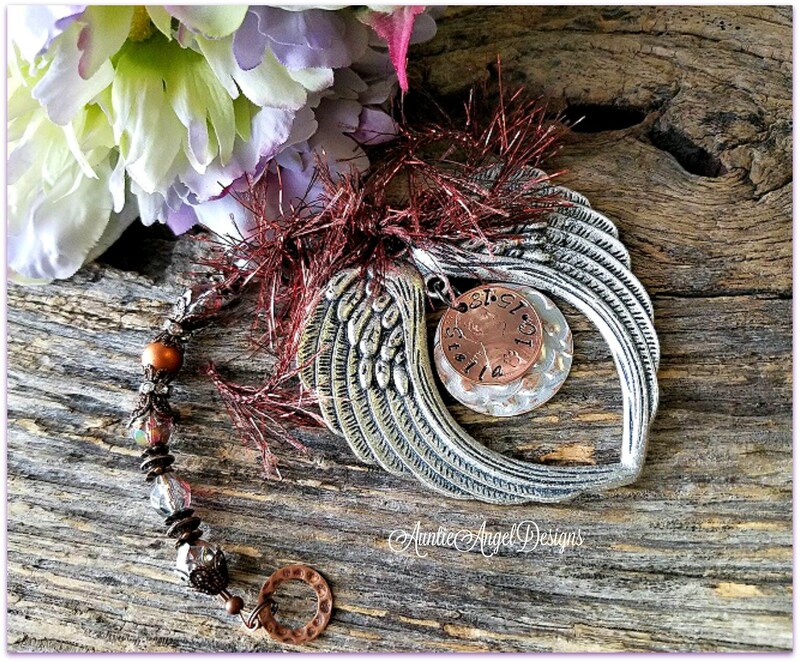 The angel wings ornament pendant dangles from a string of silvery-copper crystal faceted beads highlighting a matte-colored copper-colored bead. 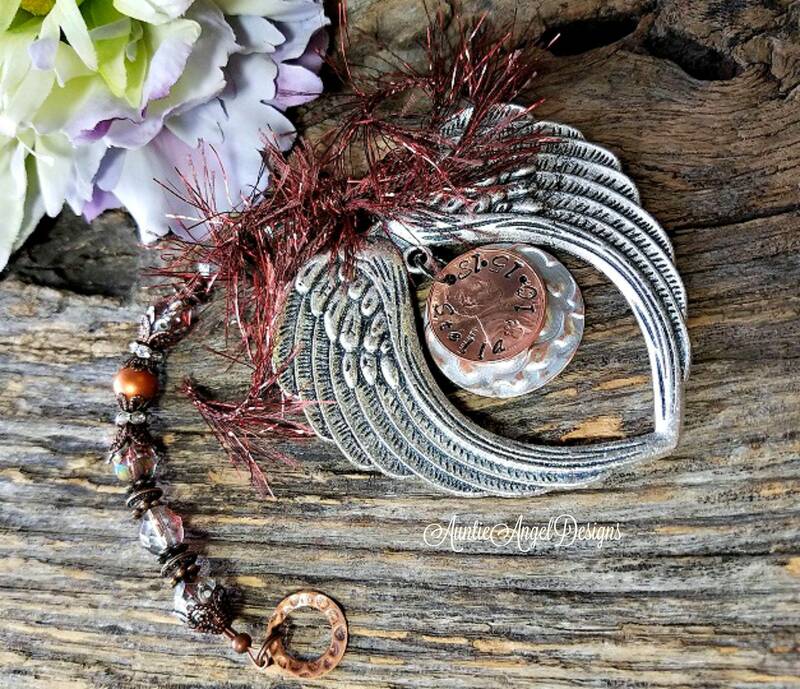 Antiqued copper and pewter filigree bead caps, antiqued copper decorative bead spacers and wavy antiqued copper rhinestone bead spacers dangle from a hammered copper ring. A festive sparkly copper-colored yarn bow completes this gorgeous piece. I customize the ornament with your person or pet's name (or name and date) hand-stamped on a shiny penny. As each letter/number is hand-stamped by me, letter by letter, number by number, alignment and spacing may, and most likely will, be slightly off, which is the beauty of a custom hand-stamped piece. The name will NOT look like it has been engraved by a machine. 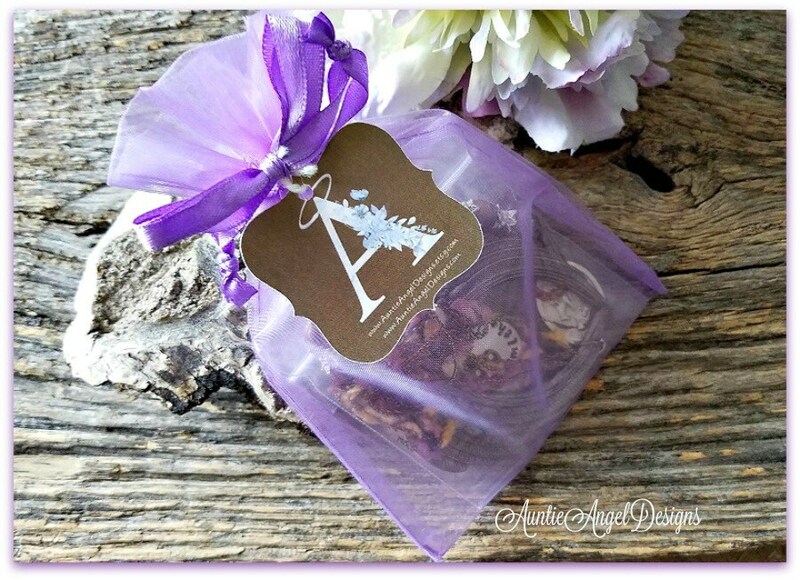 You will receive ONE angel wings ornament wrapped in a lavender organza pouch. If you elect to pay for gift wrapping, the ornament will be boxed and wrapped with ribbon and paw print paper for a pet lover or white swirl paper for a person. If I am sending this gift for you, please fill out the free Etsy gift card section during the checkout process and BE SURE TO "SIGN" YOUR NAME TO THE MESSAGE UNLESS YOU WISH TO REMAIN ANONYMOUS! 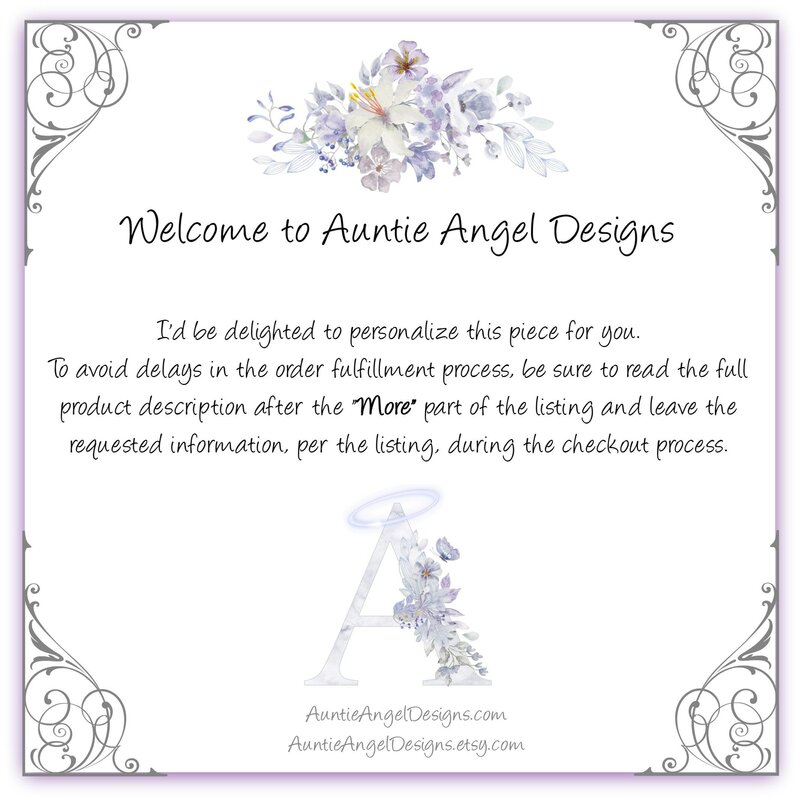 If the gift is being shipped directly to you for you to give your friend or loved one, be sure to click that this is a gift during the checkout process and I will include a blank gift enclosure card and envelope for you to personally write your message. Visit my Etsy sister shop at www.inlovingmemoryofyou.etsy.com for more memorial gifts.